Hello again! No, I haven’t been out and about any more yet, although I will be doing so soon. Last year was just a warm up – this year the real roaming of the country begins! As is my style, I have absolutely no idea what’s going to happen this year. I have vague plans to “do” the bustituted stations between Stafford and Stoke (Wedgwood, Barlaston and Norton Bridge). I also hope to spend a couple of days in Cornwall visiting the branch lines there. Beyond that, however, I have no real plans. So I’m throwing the blog open to questions from the floor. Is there an unusual station that I should put at the top of my list? A place that gets one train a week? A station inexplicably located in the middle of nowhere? A piece of rural loveliness? Comments welcome. Tees-side Airport. One train a week on a Saturday. Have a look at this small list. There is also another station somewhere in the UK which is basically a very remote National Trust nature reserve. IIRC the station consists of one platform with a tiny shed on it for a waiting room (this might have also served as a bird hide!). It was either served by two trains a day or two trains a week and both services were during daylight as there is no electric lighting at or around the station. I haven’t seen many visits on blogs to the Staffordshire ghost stations (unlike, say, the thousands of blog posts about Denton and Reddish South). Bus from Stoke to Wedgwood, then walk to Barlaston (about a mile on the canal towpath). Norton Bridge is a bit more difficult, but there is a bus from Stone. You could combine it with a trip to Etruria, which did at least go through a proper closure procedure when it shut down in 2005, although there isn’t much left of the station anymore. But it is walkable from Stoke, although it isn’t very nice. As for other stations, from Crewe you can also get to Peartree near Derby (3 trains a day each way) and Polesworth in Warwickshire (1 northbound train per day, no southbound, so probably get a bus from Tamworth to Polesworth on the forward leg, then the train back). Cosford station in Shropshire is closed until March 2012 for rebuilding – how about a report on the Rail Replacement Bus from Albrighton? Polesworth is definitely on the list, but the sole train is at a stupidly early time in the morning (for someone coming from miles away), so it will need some careful planning. 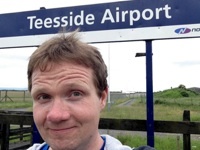 I’m also aware of Teesside Airport. In fact, there’s a few stations on the Tees Valley Line I’d like to “do” (preferably before the modernisation of the line that is being proposed). gottago – where you thinking of Berney Arms? Certainly fits your description. Apparently the only local amenity is a pub – sounds perfect!